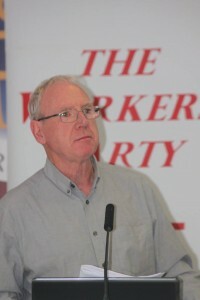 Cork Workers’ Party Councillor Ted Tynan has said that data released by the Central Statistics Office today (Wednesday) shows that what is meant to be a statutory National Minimum Wage is in fact being treated by many employers as a standard rate and that this is particularly the case in relation to young workers. Cllr. Tynan said that the data, from the Quarterly National Household Survey, is likely to seriously underestimate the extent to which employers are paying the bare minimum legal rate or less. “It is a real scandal”, said Cllr.Tynan, “that widespread exploitation of workers by employers is allowed. Where is the outrage of Social Protection Minister Leo Varadkar concerning these figures? Where is the government’s media campaign targeting law-breaking employers? As long as the government fails to launch a get-tough policy in relation to enforcement of the National Minimum Wage this exploitation will continue unchecked”. The Workers’ Party has repeated its call for the National Minimum Wage to be increased in line with the Living Wage of €11.50 per hour.